Established in 1972, Richter Scale has grown to become one of the largest scale companies in Southern Africa. 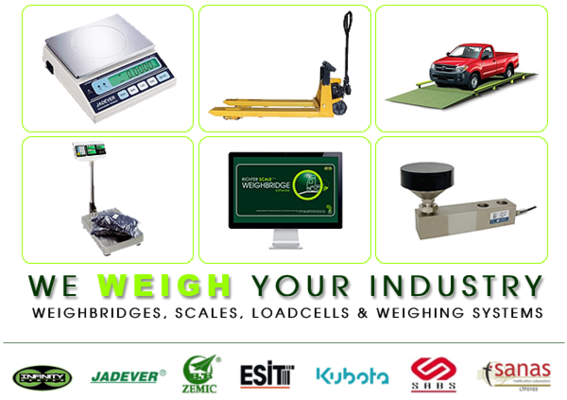 We are sole agents for ESIT, Zemic, Jadever and Right Weigh products. We promote, manufacture, sell, hire, maintain and repair the full spectrum of products, ranging from Laboratory balances to 24,5m, 120 ton weighbriges. We specialize in industrial weighing with thousands of weighbridges, platforms and crane scales designed, manufactured and commissioned throughout Sub-Saharan Africa. Click here to see the full product list. Richter Scale Co. (Pty) Ltd management team is committed to ensuring only the best products are sold with the assurance of solid back up - before and after the sale has been done. We as sole agents for all the equipment we supply and carry a full range of spares. SABS / NRCS approved stamp of quality and excellence can give you the confidence that you will get a product that meets a standard of quality, we will give you a certificate to ensure you that the product sold to you meets the SABS approval.